The following products are cameras suitable for wildlife use. To order a camera pre-installed in a box, please click on the required box on the left-hand menu. 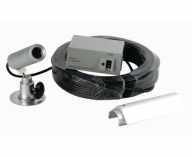 All of the cameras on this page can be connected to a television (with a composite phono video or scart input). 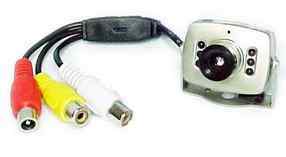 All of the cameras are supplied with a one metre audio&video cable with phono connectors, unless otherwise stated. 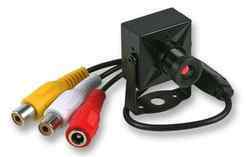 For scart input please purchase a scart adapter from our Cables page. Alternatively the cameras can be connected to a computer with a TV input card from our Computers page. This camera can work during the day and night. When in a lit environment this camera works in full colour. When in a dark environment, such as nighttime or in an unlit room, this camera uses infrared LEDs to illuminate its subject. This camera can also operate outdoors, as it is concealed in a waterproof housing. New CCD sensor option produces superior life-like colour images in daylight. 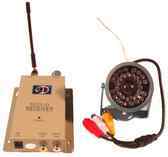 This is the wireless version of our product IRCS above. It has the same features as IRCS, but additionally has a wireless transmitter built into the camera and a separate receiver. The camera can be received up to 100 metres outdoors with line-of-sight to the receiver (actual distance is likely to be less than this, and varies depending on various conditions). The camera still requires a wire for the DC power input (the power supplies are included). 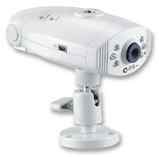 The audio and video from this camera can be obtained wirelessly, wired or both simultaneously. WIRAA note: If you're purchasing additional wireless cameras separately, please note that they will only work with a wireless receiver that has push buttons and a red number displayed on the receiver. Also when purchasing additional wireless cameras separately, please contact us with the channel number of the wireless camera(s) you already own. This is a small colour camera with microphone. This camera includes infrared LEDs for nighttime viewing. Dimensions: 38x26x14mm, the lens adds 15mm to the depth and the positionable stand adds about 10mm. This is a miniature small black and white camera with microphone. Dimensions: 30x30x20mm, the lens adds 10mm to the depth and the positionable stand adds about 10mm. This is a small colour camera with microphone. This camera does not include infrared capabilites. It is unable to produce a picture in complete darkness, but will provide a clear colour picture during the day. Dimensions: 36x36x26mm, the lens adds 14mm to the depth and the positionable stand adds about 10mm. This camera can work during the day, above or underwater. Being fully sealed, this camera can be used underwater. This camera would be suitable for use in a pond or aquarium. Submersible up to 10 metres. Choice of colour or black and white options. Infrared illumination is not included with this camera. Suitable For: Underwater (e.g. pond or fish tank) during daytime or with illumination. Can also be used out of water. View the output of this camera on your computer, via a network or USB cable. This camera can be viewed and controlled from a computer. Movements include pan, tilt and digital zoom.